Ghana producer, popularly known as Mr Beautiful by real name Kumawood actor, Clement Bonney has been missing in action more than a year and there has been speculation that he has probably quit acting. Mr Beautful has revealed that he can never stop doing what he loves at Showbiz interview. He said acting has been come part of him and the only happiness he got is him been camera . In an interview on Saturday, Mr Beautiful said he hasn’t been active on the screens because the local movie industry isn't doing well and there are a lot of unprofessional people in it. "The situation at the moment is that the industry is bad, when you have an industry where tomato sellers are becoming producers, that is what happens,” he stated. 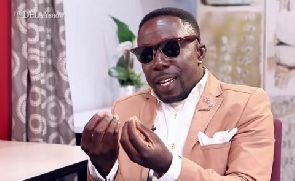 "The truth is that the industry started going down during President Kufour’s regime. That was the time we were doing Keysoap Concert Party. During that era, the late Eva Lokko of GBC increased the rate for airtime so we lost the sponsorship from Key Soap. Myself, Agya Koo, Akrobeto, Mercy Asiedu and others are all concert party products so when we got into film acting, it was very easy for us,” he added. Mr Beautiful also blamed the media for the movie industry's woes. “TV stations really annoy me when they talk about the movie industry because they are also the cause of our downfall. They bring in foreign stuff and translate into Twi for their audiences, how do they expect us to survive?